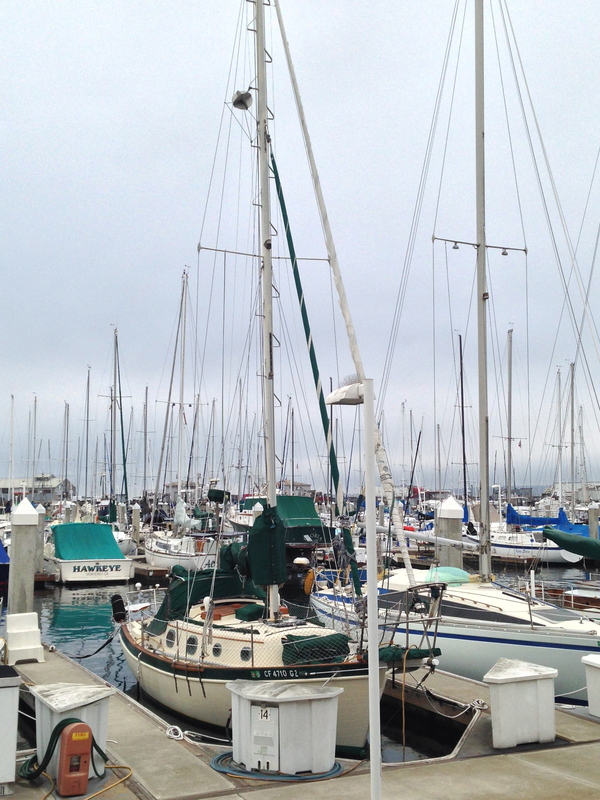 It was a cold and blustery day on the Marina, just a few short weeks ago. 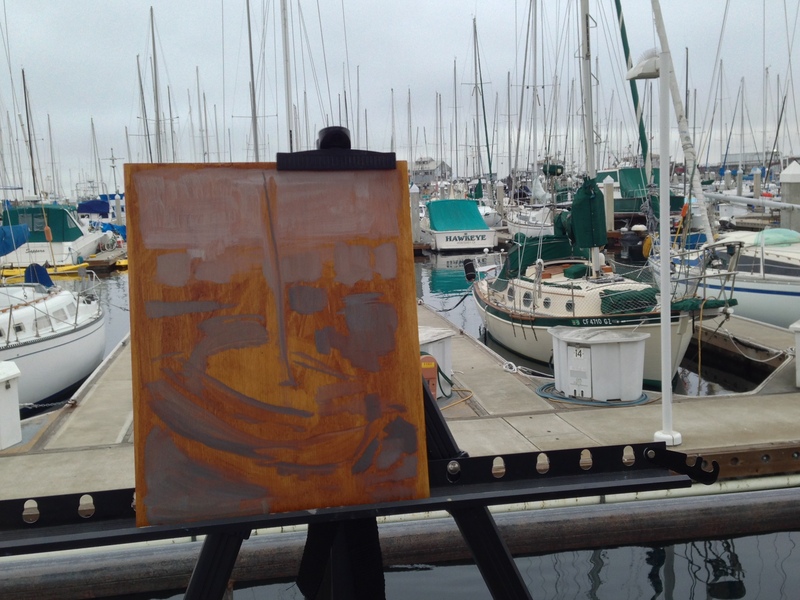 Decided to try out painting the Marina in Monterey. New images in my Gallery. 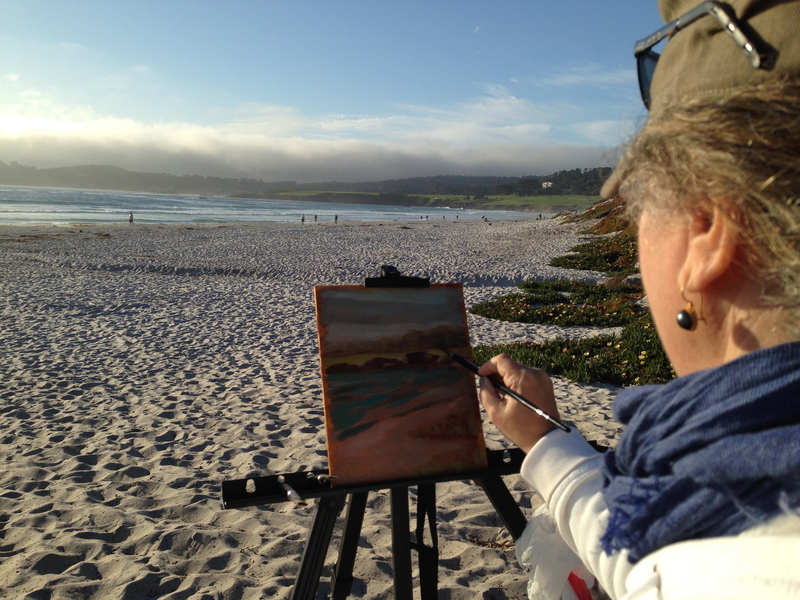 At the Plein Air Conference and Expo last month in Monterey, we had the fun of participating in a paint-out on the beautiful beach at Carmel-On-The-Sea. 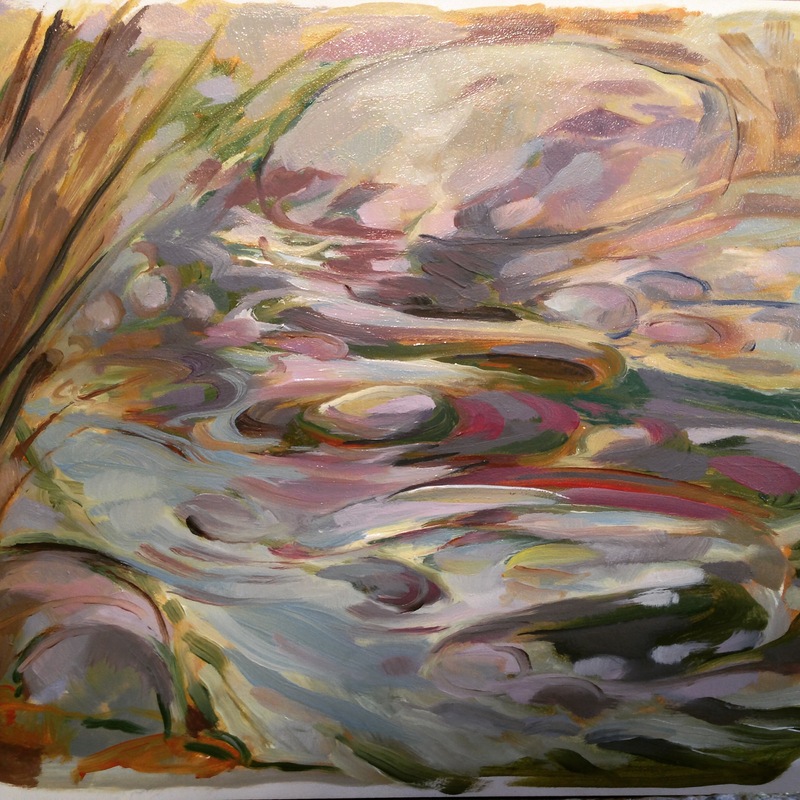 The weather was perfect, amid a group of blustery days; the sun shone and there wasn’t too much wind. 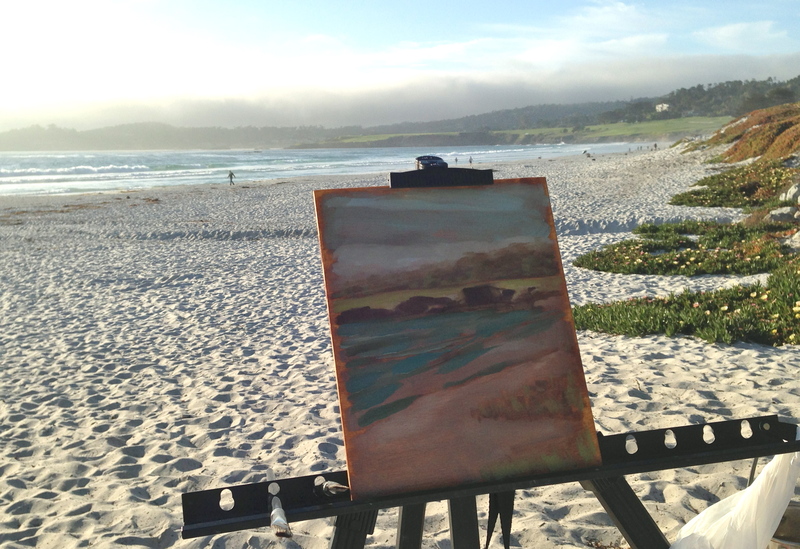 We walked down the beach a little way, towards a view of Pebble Beach off in the distance, and set up our gear. 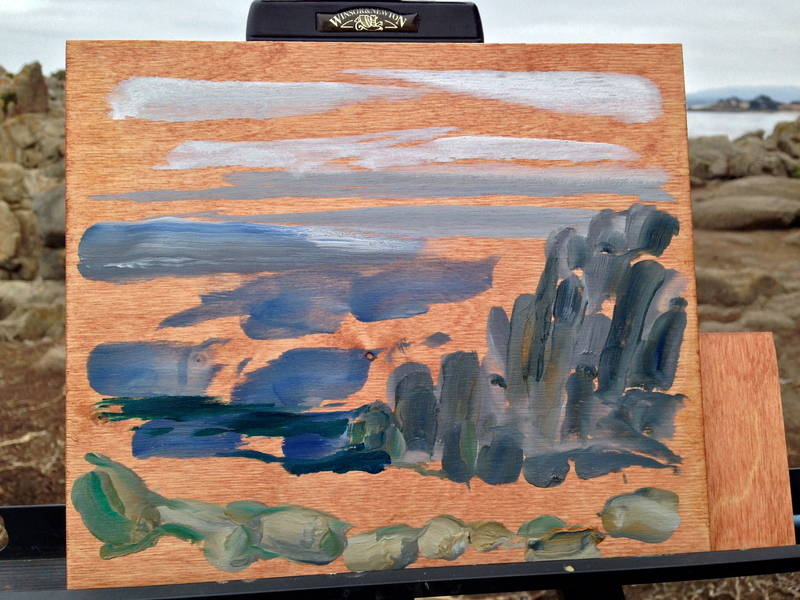 I was working on creating a quick tonal underpainting, while the fog was rolling around in the distance. 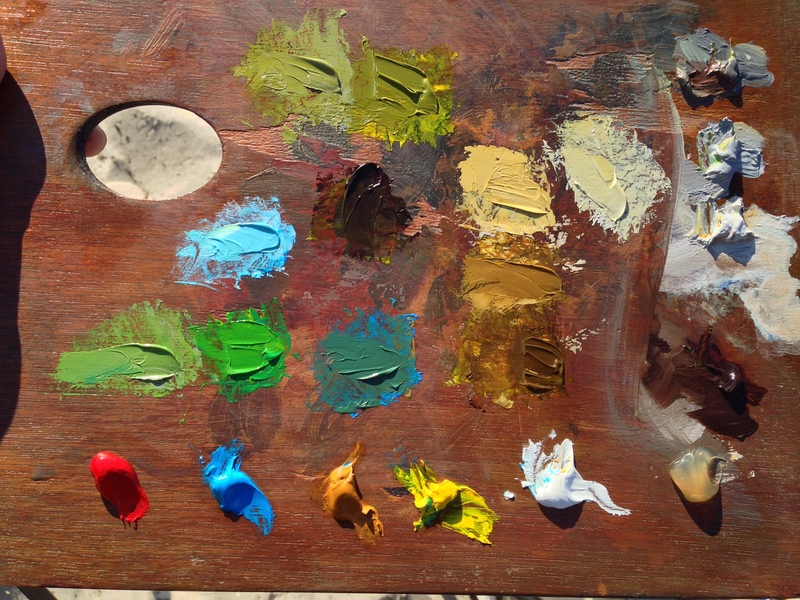 I had recently purchase a set of primary colors from Michael Harding paints (at the PACE) and was excited to play around with the oils a little, and see how far I could mix with just the primaries. 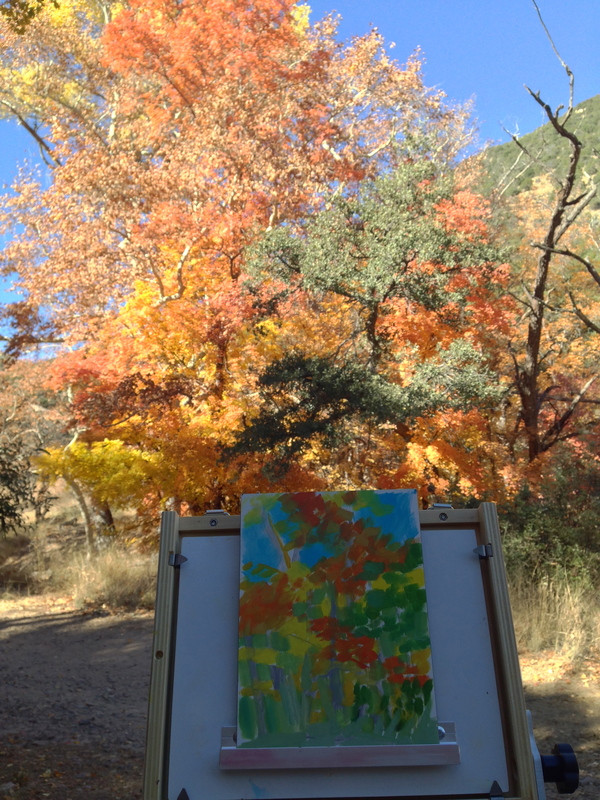 turns out I could mix some lovely tints and tones of green, which went along well with the view. 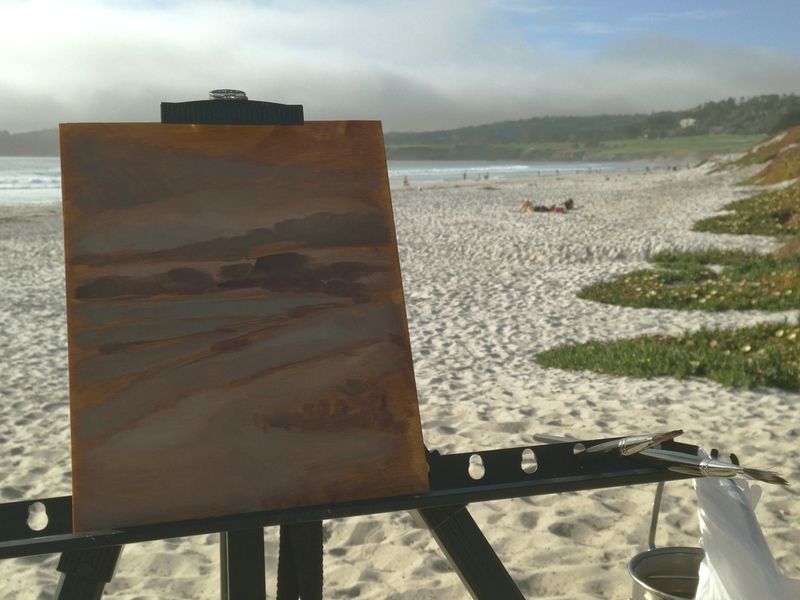 The shadows were growing long, and it was time to pack it in, go somewhere to get warm, and take a little walk in the quaint town of Carmel. 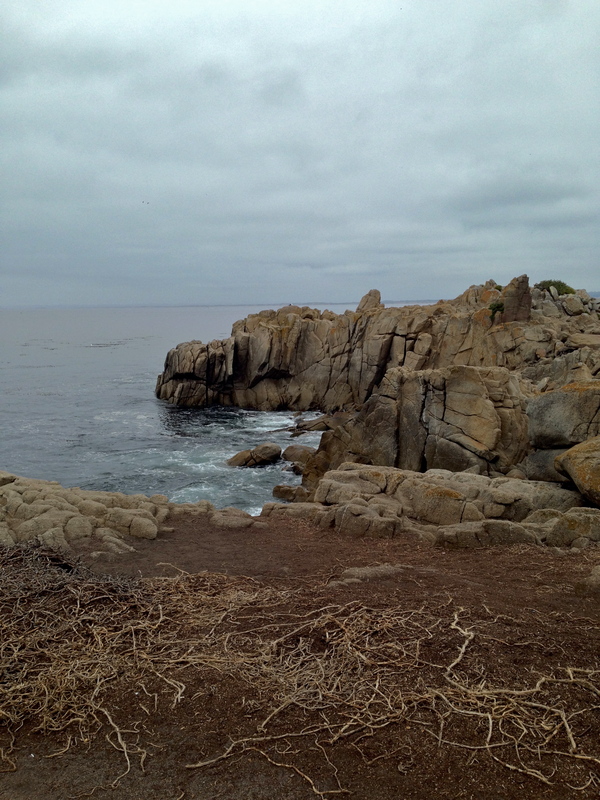 Recently we took a trip to this quaint little Victorian town near Monterey. The day was overcast and blustery, the bay was choppy and a steely grey. 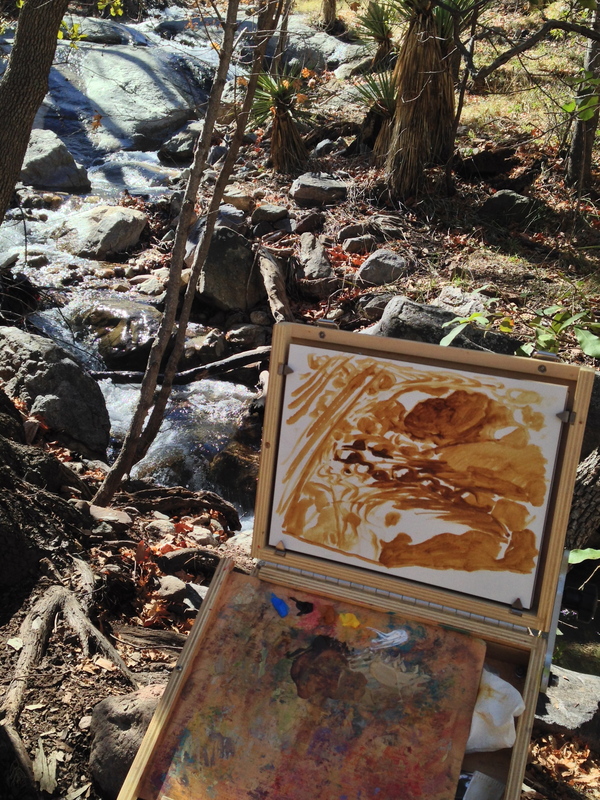 A perfect time for a quick outdoor sketch in oil. There was a little town park at the tip of the town, called Lover’s Point, a place dating back to Victorians who loved to bathe in the waters, and take boating trips in the bay. The boulders were personable, yet a little dangerous. I’m working on birch panels that have been stained a transparent earthy red to seal the wood. 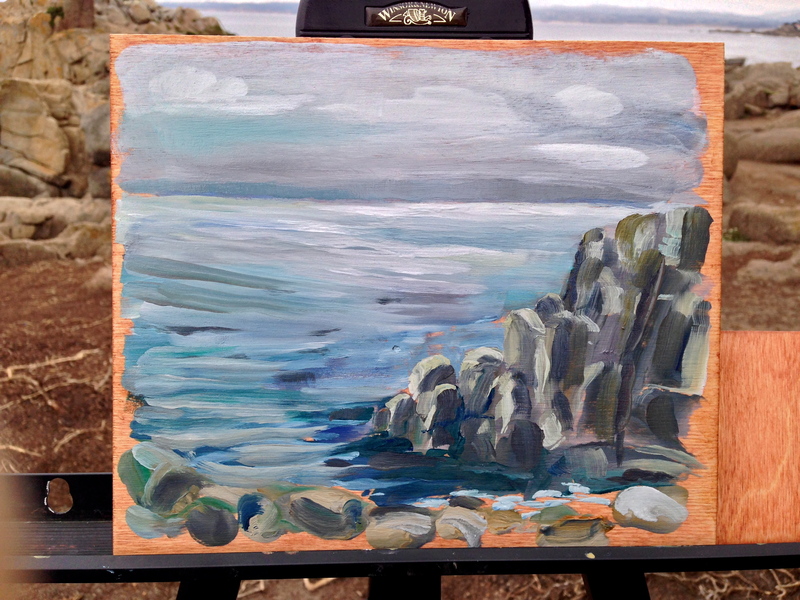 I start the sketch quickly, using marks that block in the basic shapes of the boulders, sea and sky. I noticed that the shapes of the boulders were quite smooth, leaned together at odd places, and had interesting cracks and things that seemed to go through the whole grouping. The light was fairly constant, since the sky was overcast. 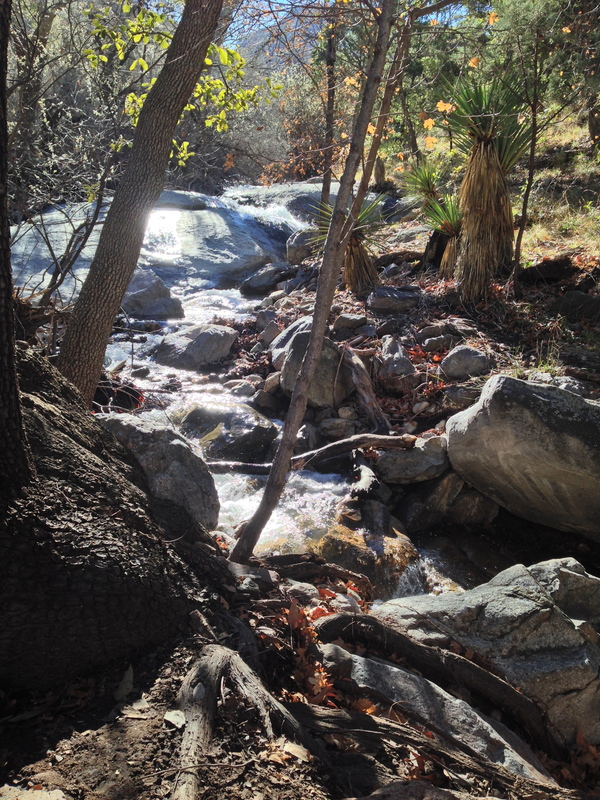 The water was moving and crashing, transparent in some places, opaque in others. 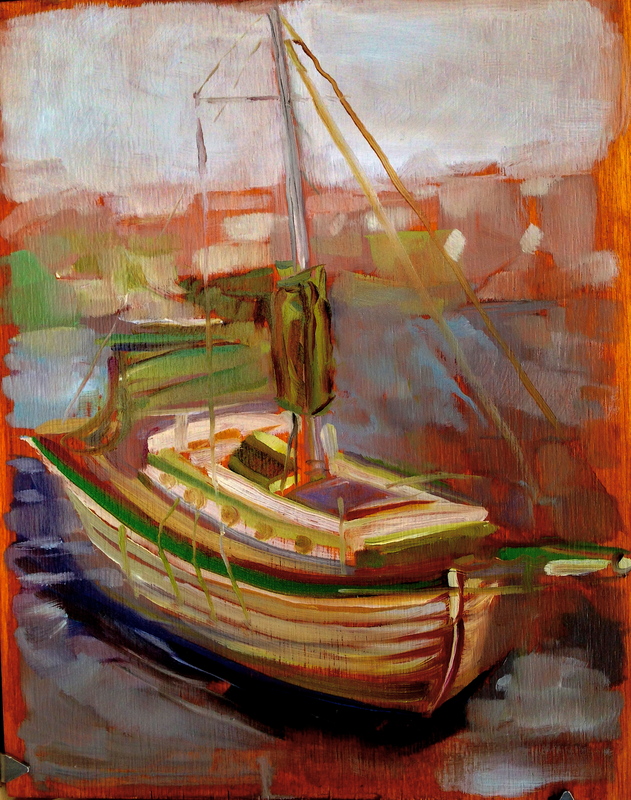 There was a misty and nostalgic atmosphere to the space and composition that I tried to keep in the painting. 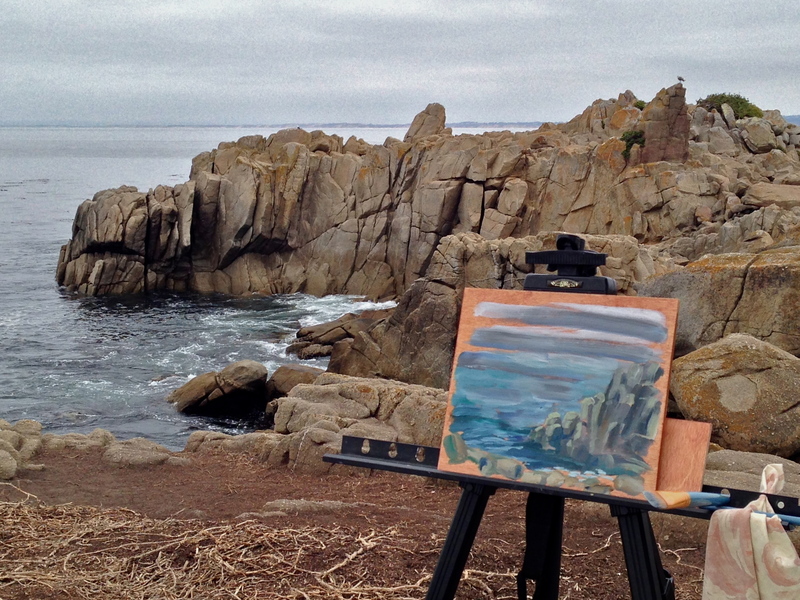 I was pleased with the way that the boulders opened up the space to the vastness of the sea. 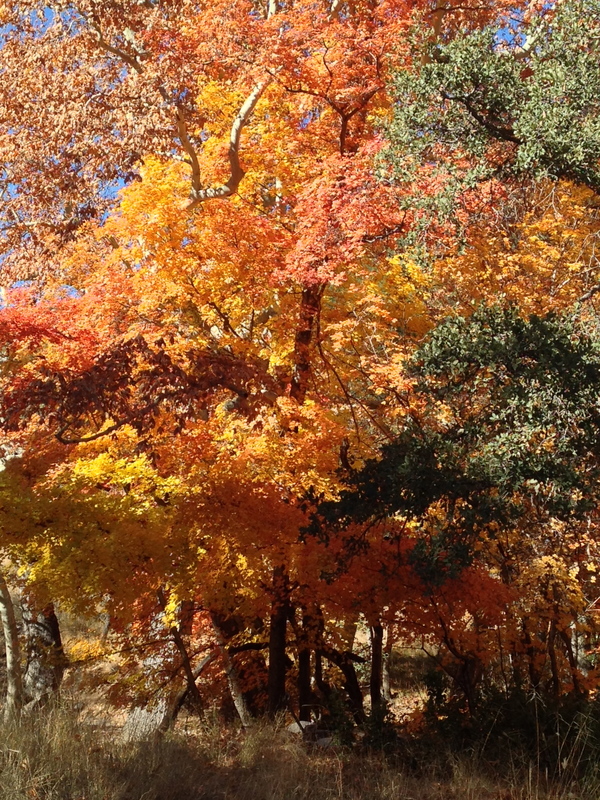 Beautiful northern California!